A guide to resources, digital projects and specialized topics for the study of archaeology as an interdisciplinary field of research on the past and present. Please include a short description of your research project. Archaeology at Brown is represented across a variety of disciplines and institutes. This guide aims to provide a basic level of coverage in available scholarly resources for students and researchers of archaeology from all subfields and persuasions. Geographically and temporally it is nearly impossible to comprehensively treat all the resources out there. Where there is a focus to this guide it is given to the regions of the Mediterranean and the Near East, however, some effort has been taken to provide coverage of other key archaeological regions and time periods. Tetrapylon of Palmyra (Tadmor), Syria. Photograph by Ian Straughn. For information about potential fieldwork on a Brown project see the JIAAW fieldwork Page. Many universities and archaeology institutions run field-schools for college credit. A listing for some of these can be found on the AAA website. 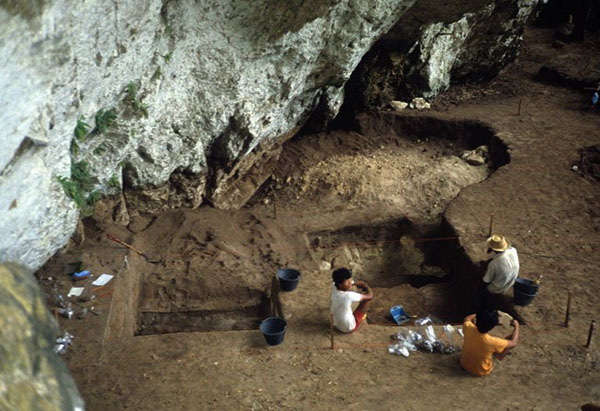 Tham Lang Rongrien site, Thailand. Photography by Doug Anderson.